*Turnbuckle :stretching screw or bottlescrew ~ is a device for adjusting the tension or length of ropes, cables, tie rods, and other tensioning systems. *Carabiner: karabiner or snap hook ~ is a metal loop with a spring-loaded gate used to quickly and reversibly connect components. *Padeye: is a flat metal plate with a projecting loop or ring, made all in one piece, providing an attachment point. It is secured by screwing, bolting, or welding it in place. 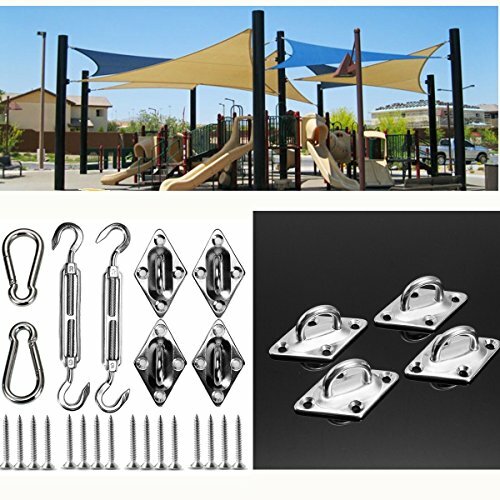 The hardware installation kit for triangle sun shade sail. Comes with everything you need to hang a shade sail. Made of high quality stainless steel for durable use. Easy to operate and accommodates most of the shade sail. Adjustable turnbuckle helps create tension. If you have any questions about this product by HAPYLY, contact us by completing and submitting the form below. If you are looking for a specif part number, please include it with your message.